A lot of you have been requesting labels for our Tin Can Treats, and I’m so excited to share them today! Mostly because they’re so stinking cute. And that’s because I didn’t make them! The fabulous Kim, from The TomKat Studio whipped these up for us. Aren’t they fabulous? If you’ve never been to Kim’s blog before, you must head over there and poke around. But make sure you have some time because you will get sucked in by all of the eye-candy and spend hours bookmarking things you think one day you will have time to do. Kim makes such beautiful things and I’m glad she shared a bit of her talent with us! How about that cute message? Thanks to YOU readers for that fun idea! I asked for some ideas on our Facebook page, and thought this was perfect. 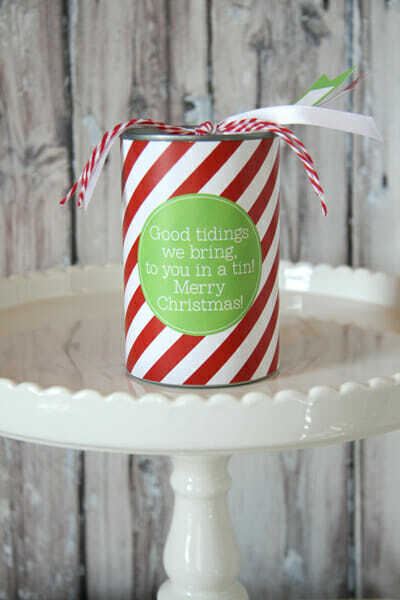 Now, if you haven’t made our Tin Can Treats before, read this tutorial. These are the perfect, unique little gift for teachers, neighbors, friends, etc. You can fill them up with homemade goodies (like Easy Pretzel Turtles or Peppermint Bark Popcorn) or store bought candy or trinkets. You can even fit gift cards in there- what a fun way to gift that, right? Kim has made a full wrap around label for us (plus tags! ), so there’s no need to cut and paste and piece things together, just wrap that label right around and then pop a little tag or two on top! There are two sizes available, a larger tag (seen above), and a smaller one that fits these mini cans. 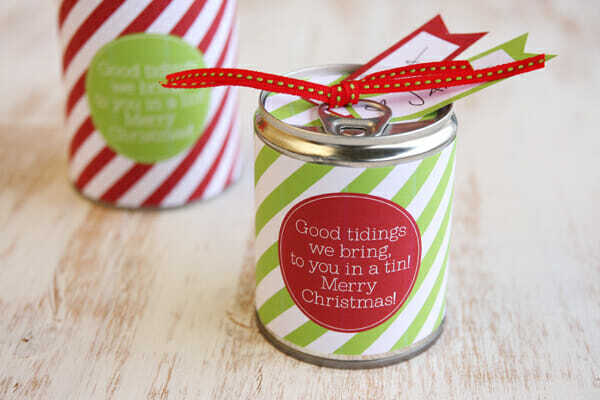 Be aware that cans come in SO many different sizes, so if you find the label to be too big, obviously just trim it to fit, and if you have a can that’s a bit larger than the label, just peel off the original can label and have some extra silver showing (hey, it’s festive!) 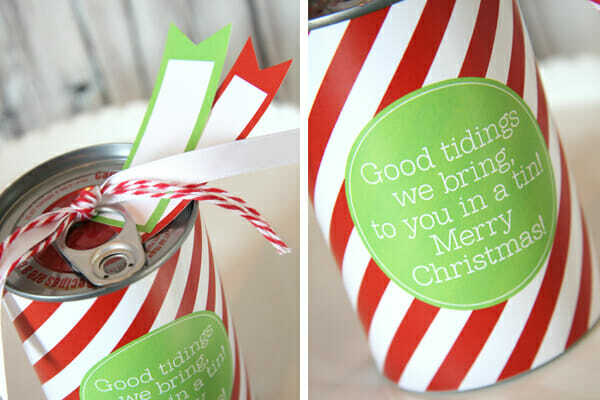 or cover your can in brown or white paper first, or you can always cover the can in wrapping paper first and just cut out the circular message. Be creative! Thanks again to Kim from The TomKat Studio, make sure you go visit her site and say hello! Annnnd, guess what? I somehow tricked her into doing one more printable for us (or, maybe she’s just super nice 🙂 I’ll post it Monday and it’s for last-minute giving when you need something, but you don’t have time to bake! Cheap, quick, and super duper easy. Get ready to stock up. To download the custom labels, click a link below. Oh my, that made me laugh out loud! I love a good pun. Is that a pun? Well whatever it is it’s hilarious! Can y’all make printables to fit the mimi M&M canisters? I can’t get them to come out correctly. I just made 9 of these yesterday (thank God my husband like fruit cocktail!). I’m using them for fun gift card holders. Can’t wait till my co-workers open them tomorrow. Your blog is the secret to my success! love using this for a way to give out gift cards! Too bad I didn’t buy any cans at the grocery store today. TFS! I have that kind of can opener on my wishlist for this very purpose! Yes, I had that on my list too-until my very smart daughter told me to just turn my regular can opener so it would cut the side and not the top – it worked! DYING from cuteness!!! Love this, such a great idea. Wow, what a cute idea. I have a cookie exchange party to go to this weekend and these labels will be perfect for the tins I’m giving each person to take their cookies home in!! Thank You!!! The teachers at my kids’ school are going to love this! This is so much cuter than just handing them their Target gift cards. Thank you! You guys are geniuses!!!! Never thought of that for a gift card! It will be my new go to holder!!! <3 it!!! Ok, I have the same two can openers that are in your tutorial, but I cannot get the darn bottoms off the cans! Is there a specific can you have to buy? Or what am I doing wrong? Thanks so much for this! I forgot to buy a card and wondered how to give my daughter’s teacher a gift card. This was perfect and so cute! where do you get the cans? Love her printable! Thank you. Thank you for helping me have the cutest presents at the kids youth group gift exchange!! Why am I just reading this? Already have the teachers gift cards ready in a card. There is always end of the school year, love it. O M G this has to be one of the cutest ideas ever !! WOW I know what all of my kids’ teachers are getting for every holiday !! Thanks so much for sharing !! There are amazing! I’m going to make some tonight! Quick Question: What are the dimensions of the labels for the standard size tin can label? I just wanted to say Thank You for this great idea; such a fun way to give gift cards or gift certs! I must have made a dozen of them this year…and I am NOT a crafty person! Thanks again!! Such a unique idea. I’m always looking for something new. Thanks for sharing. Can’t wait to get started. I’ve been saving cans in anticipation of doing this. Thanks to Kim for the label! And thanks to you for hooking us up with her! 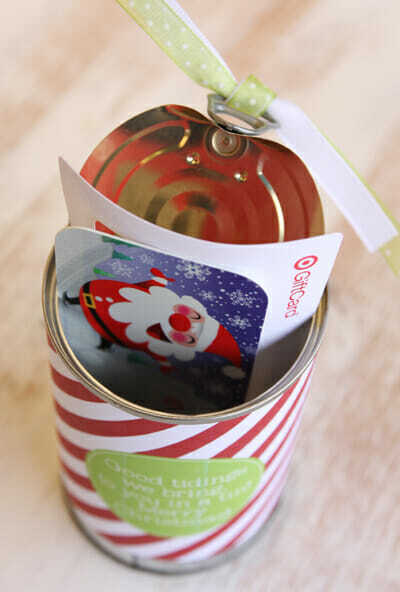 I love the idea of putting a gift card in the can!! I used the tin can to wrap my son’s first cell phone. I had family and friends send him birthday messages before his birthday and he was very surprised when he opened the can and found the phone full of messages. these are brilliant, thank you so much for sharing your creativity. I am a teacher and I will be making these for my children’s teachers. Happy Holidays! Somehow I missed a big piece: How do you get the stuff in the can? I know..you probably think I’m blond for sure! Cut the bottom off with a can opener. Then fill the can with goodies and hot glue the bottom back on. Oh wow! And I thought I was creative! These are absolutely adorable and I have to make these for my kids’ teachers this year!! Thank you so much for the ideas and printables. Cannot wait!! is there a way to get the template with just the writing? not the design? I have some really pretty paper I would love to print this on. Thanks!! Sorry, the only download is the one linked! where do you get the cans themselves?